May 19 is National Devil's Food Cake Day. This chocolate cake is America's favorite for its airy and moist texture. Devil's food cake appeared in the beginning of the 20th century as the counterpart to the white angel food cake. Its very first recipe was printed in 1905, but food historians believe, that it might have appeared earlier. Devil's food cake is very similar to red velvet cake and two names could substitute each other very often. Red velvet cake was even called red devil's cake because of its reddish color and mild flavor of cocoa. Anyway, two cakes are not the same, that is why don't confuse them! 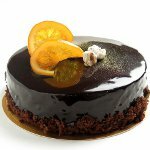 Devil's food cake tends to have darker color than usual chocolate cake and special coffee flavor. Rich chocolate frosting accompanies. The main secret of moist texture is in boiling water, that is added instead of milk. Cocoa, as opposed to chocolate, is also usually added to batter. You can bake devil's food cake to celebrate holiday. Cover it with rich chocolate frosting and enjoy the cake with your family and friends.